The bible refers to the Land of Israel as Eretz Hatzvi, Hebrew for "Land of the Gazelle". 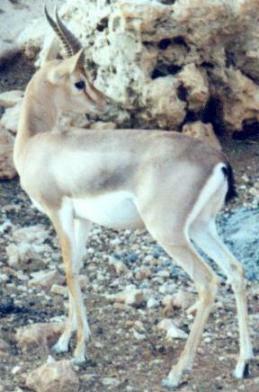 The gazelle, the biblical tzvi, is an animal whose grace and beauty symbolise both the people and the Land of Israel. Like the gazelle, the Land of Israel is beautiful, yet hardy. The gazelle is also a symbol for beauty in general. In Solomon's Song of Songs the beauty of the beloved is compared to that of a gazelle in several verses. Elsewhere in the bible the gazelle is also a metaphor for swiftness. The pages in this site contain essays and photographs of nature, landscapes and cities in the Land of Israel. Particular focus is on the area around Modi'in, the town where the webmasters live. We hope you enjoy the site and we welcome your comments. Copyright 2003 by Leiah and Jason Elbaum. Text and photographs on this page are by Leiah Elbaum. Last updated 12 March 2003.